The other night we were making a delicious Thai stir fry (leveraging curry powder -- will post the recipe soon) and we decided that we wanted to pair it with some rice. We pulled our regular brown rice out of the pantry, and then realized that it was going to take an hour to make. Then, I realized that I had bought some Lentil Khichadi rice at Whole Foods several weeks prior after sampling some at a sample station. The Lentil Rice box (see picture below) said that it only took 15 minutes to cook, so it seemed like a perfect match. Our Thai stir fry and rice cooked up in a jiffy and were way more delicious than we expected, primarily because of the consistency of the rice. The rice turned out super thick and sticky which we loved. 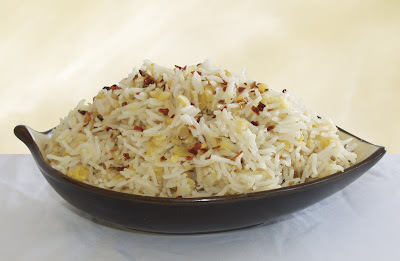 The rice was flavorful, since besides lentils and basmati rice, it is also spiced with cumin seeds, red chili flakes, black cumin seeds, and cardamom seed powder. I thought it might help to also have a picture of the box so I pasted it in to the left. I bought mine at Whole Foods. The rice is completely gluten-free, vegan, and free of additives and preservatives. One filling serving of the rice (45 grams dry) is 160 calories, 0 grams of fat, 5 grams of fiber, and 6 grams of protein -- so only 2 weight watchers points. It looks cool! If only we had a Whole Foods! I am making a Whole Foods list and this is going on it. The store is 45 minutes each way, so I only make it down once or twice a year. With all the yummy stuff you've been reviewing, I am going to have to make a trip soon! I like the boil-in-bag brown rice personally. It's already premeasured, just takes 10 minutes to boil, and I would imagine would be similar in calories than the non-instant rice. Thoughts?